All courses offered at a distance have undergone the same curriculum development, review, and approval processes than those taught in a traditional delivery method. Degree program requests to create or modify undergraduate, graduate, and professional educational programs are processed in accordance with Texas Higher Education Coordinating Board Degree Program Guidelines. The development process for all educational programs originates with the faculty. Programs are submitted, reviewed, and approved through a standard process involving University faculty and administration. Proposals originate within departments where they are reviewed by curriculum committees for academic quality, student demand, and resource requirements. Successful proposals must include a statement of learning outcomes and procedures for ongoing assessments. Proposals that are approved by the department are then forwarded to college-wide curriculum committees and subsequently to the University Curriculum Committee. Review at these levels focuses on the relevance of the proposed program to the University’s mission, its relevance to existing programs, and the capability of the department to support the program. Program proposals that are approved by the University Curriculum Committee are recommended to the Provost and Vice President for Academic Affairs, who in turn reviews them and forwards those that are approved to the President. The President then forwards these proposals to the Texas A&M University System and to the Texas A&M University System Board of Regents for approval and then to the Texas Higher Education Coordinating Board (THECB). Once a program has been approved, the curriculum committee at each department will select a delivery modality. The proposal of courses being considered for distance learning delivery is carefully analyzed by the curriculum committee and it must include a statement of learning outcomes and procedures for on-going assessment. Once the Dean of the College approves the proposal, the process of development/adaptation begins with the faculty member that will develop the course materials. A quality assurance program was adopted by Texas A&M International University (TAMIU) through the Distance Education and Instructional Technology Committee (DEITC) in September 2011 with the purpose of ensuring the quality of its online courses. TAMIU has adopted the nationally recognized Quality Matters (QM) program for its peer-based approach. The course developer is an integral part of the internal review process with shared responsibility and ownership. Online instructors are required to participate in professional development workshops on how to apply the QM rubric in constructing or revising their online course. Courses developed (through the development process listed below) will be required to meet at least 85% of QM standards in course review(s) in order to be QM recognized. 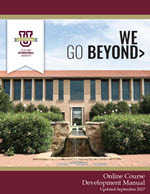 Visit TAMIU's Quality Matters website for more information. TAMIU has the intent to provide high quality online courses to its students. The Instructional Technology and Distance Education Services office, powered by the Office of Information Technology (OIT), is responsible for providing support to faculty in all stages of the development process: planning, designing, and delivery. OIT is also responsible for archiving course materials developed by faculty contracted as "work-for-hire" for the University. The following procedures will be followed for developing online courses. Course developer must submit a Statement of Intent (PDF) to Instructional Technology and Distance Education Services. OIT will then acquire the appropriate signatures from the appropriate academic administrators (department chair, college dean and provost). After receiving the fully-approved Statement of Intent, the course developer will be provided an Online Course Procedures and Agreement form (PDF) and a Service Contract Agreement form (PDF). OIT will acquire appropriate signatures from the appropriate administrators (department chair, college dean, provost and Director of OIT for Procedures and Agreement form and Director of Instructional Technology and Distance Education Services, Vice President for Finance and Administration, and Director of Budget, Payroll & Fiscal Analysis). If you need a form, please contact us at 956-326-2792 or at elearning@tamiu.edu. A requirement for course development includes the completion of Applying the QM Rubric (APPQMR) workshop offered by Quality Matters. For more information over QM Professional Development, visit our TAMIU QM web page on training sessions. Contact eLearning (elearning@tamiu.edu) to be registered for the next available workshop. An Instructional Technology Coordinator will be assigned to a course developer for assistance in implementing appropriate course design and in providing feedback throughout the process. Alignment document (course mapping document) is provided to course developer for aligning course objectives, module objectives, materials, activities, assessments and technology. View Alignment Document Version 1. View Alignment Document Version 2. Based off the alignment document, course developer designs course in TAMIU's Learning Management System. Developer must teach course for at least one semester. After course is delivered, faculty may make adjustments for a month after delivery. Course will then go up for QM course review(s). View our Quality Matters page over the full review process of online courses. Course developer will be compensated upon fulfillment of responsibilities stated in Online Course Procedures and Agreement. After official review, course will be recognized for meeting QM standards. Course will receive recognition on TAMIU's Quality Matters page under courses that are recognized by QM. Course will receive QM certification mark displayed in course. Course will be made available to any future instructor wishing to teach from QM-certified course. Only minor changes may be made to course (instructor introduction, contact information, etc.). View our Online Course Development Manual for detailed explanations of online course development at TAMIU, including development procedure, course development recommendations, syllabus recommendations, etc. Click link above to view flipbook.